He takes the score and runs with it. His famous -- infamous to concert planners -- reluctance to decide on a precise programme until the concert is virtually imminent is not the result of an oversize ego but a simple need to play only what he feels close to at any given moment. Whatever he's playing, be it Couperin or Chopin, Beethoven or Prokofiev, he seems to have the ability to disappear into the world of each composer . . . drawing out elements that you've never heard before, yet without sounding mannered. That is quite something . . . ["The Salzburg Recital"]: two things particularly struck me: the first was how consistent Sokolov's vision of the Chopin Preludes was . . . and, second, the glory of his encores, which perhaps sum up his sheer range of interests as well as anything: Rameau, Chopin, Scriabin and, to end, Bach.
. . . an outstanding recording . . . revelatory performances . . . This rare release will be warmly welcomed by Sokolov's army of devoted fans, some of whom try to attend all of his extraordinary concerts.
. . . a triumph . . . [from the beginning of Mozart's F major sonata, K 280,] the Sokolov spell is cast. The graceful, crisp articulation; the little hesitations, so carefully wrought -- here is poetic and intimate playing of the highest order. Another Sokolov enters with the Adagio movement: a pianist in the traditional Russian manner, eager to paint notes dark in tones of great solidity. His Russian soul reappears in the magical kaleidoscope of Chopin's 24 Preludes, where the second piece, the A minor Lento, trundles by like the ox cart in "Pictures at an Exhibition". Contrast that with his limpid pirouettes in the early stages of No. 15, or the wonderful freshness in phrasing and weighting in No. 7, such a familiar morsel. His 57 varieties of touch and texture feature just as clearly in the generous encores, all six of them, from extra Chopin through dream-like Scriabin to the jaunty trills of Rameau's "Les Sauvages" . . . with a piano giant like Sokolov, it's hard to keep enthusiasm bottled. For me, the Mozart sonatas exemplify the essence of Sokolov's playing: he can do things with a melody that are just amazing. The way he phrases Mozart's slow movements is a joy to hear: thoughtful and individual without being fussy, he makes those melodies sing in a way that is incomparable. This gift for lyricism is equally present in the Chopin: the F sharp major prelude is the epitome of beauty; it's so extraordinarily played, and as dazzled as I was elsewhere in the set by Sokolov's stupefyingly fast passagework and clarity of touch even in the most blisteringly rapid pieces, it was this one out of the twenty-four that I kept coming back to. Similarly, in the famous D flat major prelude (commonly known as the "Raindrop"), although I must have heard this piece countless times, Sokolov managed to make it sound so fresh. His tempo here is relatively slow (clocking in at just over seven minutes), but at no stage did I tire of it or think "Oh yes, this one again": the way he shapes every phrase and draws new colours from the piano in almost every bar is really astonishing. Even the shortest of the pieces, such as the sixteen-bar A major prelude, are sculpted into complete statements with something to say, rather than being despatched as mere throwaway items within the set. Also included on the disc is Sokolov's generous selection of encores (six in all), ranging from Bach to Scriabin by way of Rameau and two Chopin mazurkas. Sokolov ends with the Bach ("Ich ruf zu dir, Herr Jesu Christ" BWV 639), and after all of the fireworks from the Chopin, it's an inspired, serene way to end his recital, again demonstrating perfectly his extraordinary facility with a melody. There must be many more recordings in Sokolov's archive waiting to be released, and on the strength of this first offering I simply cannot wait to hear more from this stunning artist.
. . . [the imagination and concentration of his playing are] transfixing . . . The recording also captures another characteristic of a Sokolov recital -- the breadth and inquiring nature of his repertoire . . . As is so often the case with the greatest musicians, it is hard, and perhaps not always desirable or essential, to analyse what makes them great. 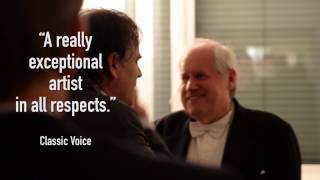 It is simply a fact that, listening to Sokolov, you know unequivocally that you are in the presence of someone extraordinary, someone possessing special insights and a thoroughly individual way of articulating, clarifying and communing with music so that his interpretations seem to find its very heart. You could point here to the artless embellishment he applies to the first movement recapitulation of Mozart's K332, but that is just an integral facet of a reading that is luminous, lucid and immaculately layered in terms of texture and colour. Likewise, in the Chopin studies, each of the 24 conjures up a miniature emotional world, beautifully encapsulated and purely expressed . . . a recital of truly exceptional stature. Dazzling piano playing from a rarely heard master . . . the superb Russian pianist Grigory Sokolov presents an outstanding live recording from the Salzburg Festival . . . Here Sokolov offers two piano sonatas in F major by Mozart, played with tremendous virtuosity and conviction but erring towards a free-flowing Romantic interpretation. His Chopin performances here are equally personal -- and captivating. As a bonus there are encore pieces from Scriabin, Rameau, and Bach which show off Sokolov's brilliance in all its varied moods.
. . . one of the world's greatest living pianists . . . Some of the playing is breathtaking in its clarity, articulation and colour . . . [the Mozart playing] overflows with vitality, each movement conceived as a single, sweeping entity, while each of the Chopin Preludes manages to conjure up a complete expressive world in a miniature frame. There's more Chopin among the encores (two of the late mazurkas) along with Rameau, Bach, and Scriabin's Two Poèmes, Op 69. It's all to treasure.
. . . [in the Mozart piano sonatas, Sokolov is] micro-managing the music so that no phrase sounds the same twice . . . [in Chopin's Preludes] Sokolov ranges from introspective musing to his native Russian virtuosity.
. . . what is it that makes him so remarkable? For a start, there's an element of unpredictability: not for him the trotting-out of an ever-diminishing range of repertoire. There's a thirst there, and some of the repertoire he comes up with is remarkable for its unpianistic qualities . . . He takes the score and runs with it . . . [whatever he's playing,] he seems to have the ability to disappear into the world of each composer . . . drawing out elements that you've never heard before, yet without sounding mannered. That is quite something . . . [The Salzburg Recital CD]: [what particularly struck me was] how consistent Sokolov's vision of the Chopin Preludes was when you compared it with his earlier release . . . and, second, the glory of his encores, which perhaps sum up his sheer range of interests as well as anything . . .
. . . he is inimitable. His Chopin Preludes, for example, have no time for the notion of a freely Romantic melodic line being kept in check by a Classical accompaniment . . . he begins unhurriedly, as if the music were gently rousing itself into life. But whereas in less imaginative hands the results could seem mannered or overly drawn out, here it's mesmerising. In the Sixth Prelude, for instance, the upward curling arpeggio has a rare poignancy, while the Tenth glistens but also has an unexpected hesitancy about it. In no. 13, the glorious melody of the middle section is given with a freedom that would simply not work in a lesser musician; while in the infamous "Raindrop", Sokolov replaces the constant dripping with a shifting pulse that has a real urgency, albeit an unconventional one. No. 19 is a particular highlight, its delicacy quite heart-stopping. He ends as he began, with a tempo for no. 24 that has gravitas (not to be confused with heaviness), the effect granitic, magisterial. The Mozart is treasurable too . . . What he does with the slow movement of K 280, for instance, gives it a kind of operatic reach and breadth, though never does it lapse into histrionics. And in the finale he brings out the main theme's stuttering quality superbly, lending the music not just a mercurial quality but a dramatic one too. His delight in the chewy harmonies of the opening movement of K 332 is palpable, his phrasing iridescent in its range . . . The Scriabin "Poèmes" are more than usually clear descendants of Chopin in Sokolov's hands and the filigree is out of this world. By contrast, Rameau's "Les Sauvages" is unexpectedly playful and whimsical, and we end with a clear-sighted Bach chorale prelude that is all the more moving for its apparent simplicity. As Sokolov says in the booklet: "I play only what I want to play at the current moment." Perhaps that's what gives this set such integrity. It's an overused word, but he is inimitable . . . [Chopin / Preludes]: Sokolov begins unhurriedly, as if the music were gently rousing itself into life. But whereas in less imaginative hands the results could seem mannered or overly drawn out, here it's mesmerising. In the Sixth Prelude, for instance, the upward curling arpeggio has a rare poignancy, while the Tenth glistens but also has an unexpected hesitancy about it. In No 13, the glorious melody of the middle section is given with a freedom that would simply not work in a lesser musician; while in the infamous 'Raindrop', Sokolov replaces the constant dripping with a shifting pulse that has a real urgency . . . No 19 is a particular highlight, its delicacy quite heart-stopping. He ends as he began, with a tempo for No 24 that has gravitas, the effect granitic, magisterial. The Mozart too is treasurable . . . [Mozart]: What he does with the slow movement of K280, for instance, gives it a kind of operatic depth and breadth, though never does it lapse into histrionics. And in the finale he brings out the main theme's stuttering quality superbly, lending the music not just a mercurial quality but a dramatic one too. His delight in the chewy harmonics of the opening movement of K332 is palpable, his phrasing iridescent in its range . . . As Sokolov says in the booklet: 'I play only what I want to play in the current moment.' Perhaps that's what gives this set such integrity.
. . . [this recital] reveals the pianist's extraordinary finesse, concentration, and individuality in full fettle . . . [Chopin]: The present F minor Prelude scores for heightened dynamic contrasts and dramatic flair . . . The two Mozart sonatas that open the recital are highly calibrated and polished from a pianistic angle, subjecting all phrases, ornaments, dynamic scaling, contrapuntal balances, and chord voicings to immense scrutiny. But don't get the impression that Sokolov is embalming Mozart: far from it. His judicious tempo choices and consistently singing tone keep the music alive and engaging, especially in the slow movements. If anything, the encores are even more magical. The two Scriabin Op. 69 "Poèmes" stand out for Sokolov's gorgeous textural layering and nuanced rapid figurations. A moody and hypnotically sustained Chopin A minor Mazurka Op. 68 No. 2 precedes a C-sharp minor Op. 63 No. 3 Mazurka where nearly each measure suggests a different mood and keeps you guessing, yet manages to logically flow from one into the next. After an ebullient and brilliantly ornamented Rameau "Les Sauvages", Sokolov closes with a Bach/Busoni "Ich ruf zu dir" where the pianist's ideal alignment of top chorale melody, animated inner voices, and gently present bass lines creates a lovely transparency . . . The Sokolov 2008 recital from Salzburg reveals a thoughtful, poetic artist whose repertory embraces a grand range of styles . . . [Mozart K. 332 / 1st movement]: Sokolov delivers a haunted rendition, rife with ominous undercurrents . . . Sokolov's distinct clarity of the musical line projects an alertness to the proceedings that arrests us throughout . . . [Chopin]: From the C Major Prelude, we enter a sacred space, and already the G Major rings with elevated radiance. The graduated diminuendo in the E Minor casts a lonely glow, given the piece's innate melancholy. The D Major emerges as a knotty metrics etude. Sokolov makes the case that the B Minor -- not merely the D-flat Major -- deserves the epithet "raindrop" for a nocturne of resonant beauty . . . Sokolov concludes with a Bach chorale-prelude of subjective, restrained beauty . . . May the gods grant Sokolov a more enduring fate on this plane of existence! His playing is always compelling, not least because of his unique approach . . . His Mozart, though slow, is never laboured or ponderous, being extremely controlled; the long phrases are felt out with utmost certainty in spite of an almost dry approach and contained dynamics. This is utterly compelling Mozart, a perfect example of restraint yielding deeply satisfying results. A dissenting opinion from that of other artists but Mozart's mercurial genius allows for this. This recital of Chopin's 24 Preludes would be one of my desert island discs. In keeping with his way, each of the 24 has an individual character and taken together they are a marvel of authority and subtlety . . . deeply introspective and mesmerizing . . . astonishing . . . The six encores (Chopin, Scriabin, Rameau and Bach) are no less considered.
. . . [Mozart K. 280 & 332]: Sokolov observes all repeats. In the repeated sections of some movements he incorporates extra embellishments and ornamentations. These are all tastefully executed . . . All Sokolov's improvisational variants positively add diversity to the readings. The highlight of this recital for me is Chopin's 24 Preludes . . . the phrasing and articulation are exquisite . . . The Rameau and Bach I found particularly pleasing . . . The recorded sound is superb and immediate, with the Salzburg audience being in no way intrusive. Their enthusiasm and appreciation is suitably registered at the end of each work. The applause says it all. It's no surprise that the encores here should form the most arresting part of this release. But the Mozart sonatas with which he begins are also striking, with the sound coming over in bold close-up, and the sparingly applied ornamentation possessing a crystalline purity. The opening Allegros are unhurried and spacious, while every bar of the slow movements is pervaded by an intimately expressive gravity. Each of Chopin's Preludes feels freshly imagined, with some being opened out into an intensely dramatic dialogue, and the contrasts are often extreme: the fury of No. 12 followed by the honeyed grace of No. 13, the snarl of No. 22 by the pastoral peace of No. 23 . . . When it comes to the encores, the rarely performed Scriabin pieces are nicely balanced by the Chopin ones, the Rameau hints at a completely different sound-world and the Bach comes like a benediction.
. . . [the word 'divinely' sums this 2-CD set] up best. Most surprising is his dynamic range, which runs from a tender whisper to a thundering fortissimo, albeit never hard or banging, and always with a glorious singing tone. His Mozart looks towards Beethoven and his Chopin to Brahms. It is full of taste -- original without ever being idiosyncratic and always totally musically convincing. The many encores encompass everything from a euphoric Scriabin to a Bach best described by the German word ' innigkeit'. Sokolov's is truly an art of piano playing no other living pianist could ever imitate. Sokolov explores the music for its dynamism and character and engages the listener not just with his perceptive and personal approach but in being able to convince -- totally -- that this is how the music goes . . . [Mozart]: In K280 the central Adagio is deeply expressive, rapt, utterly transporting . . . an elevated account of the equally lofty K332 Sonata, an outstanding, time-taken reading that has one in wonderment of the music while appreciating Sokolov's glorious interpretation and also his sensitivity and variety at the keyboard. He revels in the cut and thrust of the finale . . . [Sokolov gives] as divine an account of Chopin's 24 Preludes as you could wish for, played as a continuous sequence . . . This is some of the most soulful and impassioned Chopin-playing you will ever hear, and so sympathetically modulated too, tender and delicate, leonine and athletic -- each of the Preludes' worlds opened up yet threaded through so that everything belongs . . . a Chorale Prelude by J. S. Bach that is simply sublime and during which my blood ran cold if bringing with it the sweetest of sensations . . . he is one of the very greatest of pianists, true to himself and the music he plays -- and on this July day in Salzburg he was superb. Austrian Radio's recording is ideally intimate and truthful, capturing verbatim a notable event, something I was unable to take my ears away from, a redefining experience. A beautifully captured live performance . . . Sokolov's performances of Mozart's sonatas K280 and K330 on the first CD sound warm and relaxed, rich and considered, yet curiously avoid sounding dated or old-fashioned. The second CD is mostly given over to the 24 Chopin Preludes, and again the playing is very roomy and spacious. The live recordings sound natural and full-bodied with natural tone quality and plenty of atmosphere. Recitals by Sokolov are to be cherished, as this release so conclusively shows . . . [Mozart]: immediately it is apparent that one is in the presence of greatness. Sokolov's playing implies no other avenue of interpretation is conceivable; in addition, his accuracy is stunning. The polyphonic aspect of K 332 is beautifully rendered, while its first movement seems to have a supernatural amount of space in which to breathe, but without any sense of undue lingering . . . [in the slow movement] the beauty of Sokolov's tone (so perfectly caught by the recording), coupled with his limpid, bitter-sweet phrasing, makes this a transcendental experience; the brightness of the finale enables perfect balance . . . [Chopin / Preludes]: Sokolov finds the perfect balance between emotion and intellect. Sokolov's shadings of phrase are quite remarkable (try No 4, the E minor), his technique impeccable, his grasp of texture and detail second to none (the ravishing No 23 in F major) . . . A remarkable release.
. . . the recital turns out to be one of his best ever, captured in luscious piano sound . . . his monumental performances of the two F Major Sonatas, K. 280 & 332, may have startled the horses at the nearby Felsenreitschule . . . Sokolov's full-blooded Chopin Preludes stop you in your tracks. Time and again you have the feeling of the pianist's wiping the slate clean, listening in on this concentrated, extraordinary music with wide-eared wonder, then passing on what he hears. It's playing of power, delicacy and astounding beauty . . . The contrary motion in these deceptively "simple" pieces is rarely brought out with this skill, and Sokolov's gift for tracing, if not underlining inner voices pays big dividends . . . The six encores bring more living, breathing Chopin (two mazurkas), gossamer Scriabin, Rameau that sounds terrific on the piano, and a traversal of Bach's chorale prelude "Ich ruf' zu dir, Herr Jesu Christ" from which nothing else could follow, yes, but musical to its marrow.
. . . These are some of the finest piano recordings one could ever hope to hear . . . Sokolov plays Mozart with an incredible beauty of tone . . . Listening to Sokolov play, one cannot help but be astonished by the beauty of tone in every register from the deepest bass to the highest treble notes . . . [the sheer beauty of the sound is] breathtaking. Then there is the clarity of articulation, which is a wonder to hear. The phrasing, though impeccably tasteful in "classical" style, is neither boring nor lacking in individuality, but rather, incredibly expressive . . . in Chopin's Préludes Op. 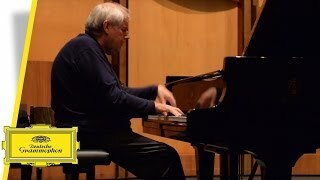 28, Sokolov gave an absolute master class in how these pieces should be played. He was dazzling in Nos. 3 and 5, and the chromatic intensity of his No. 8 was gripping. In No. 12, he conveyed the image of an enormous strutting horse, both majestic and frightening. In No. 15 in D flat major, the longest of the Preludes, he maintained a hypnotic "sostenuto" and the "fortissimos", when they came, were full-throated without any sense of banging. Sokolov's sense of rubato in Chopin is almost unique. If one follows along with the score, one can see that he remains invariably faithful to the printed music while finding the poetry behind the notes . . . [each of his encores] was a gem . . . "Les Sauvages" by Rameau with the most fastidious ornamentation one could imagine . . .
. . . a marvelous program, filled with some startling insights and a real depth . . . [the two Mozart sonatas are played with astounding seriousness,] but also a generosity of spirit that is wholly moving. Details are everywhere, but you never get the impression that the music is over-thought or over-wrought . . . The Chopin Préludes are tremendously convincing, and a lifetime of experience is reflected in every bar . . . The two Chopin encores are equally mesmerizing; with a kind of hushed rapture that holds the attention. What strikes you immediately in the first of the Mozart sonatas is the breathtaking ease of the playing. With its flawless runs, sensitive phrasing and immaculate textures, this is what the Germans call "Fingerfertigkeit" of the highest order . . . [Chopin / Préludes]: highly individual interpretation featuring electrifying execution -- No. 16 flies by with a speed and dexterity that only Marc-Andre Hamelin could match . . .
. . . [Sokolov's Mozart Sonata interpretations] are marvels of taste and touch, done with such effortless mastery that you can't tear yourself away. Every phrase is individually and beautifully shaped . . . [the six encores are magical miniatures] with much said in little . . . The concluding Bach Chorale Prelude closes the evening with unaffected eloquence . . . Excellent recorded sound. The word 'divinely' probably sums it up best . . . Sokolov's is truly an art of playing the piano no other living pianist could ever dream of imitating. In Sokolov's playing there is an absolute prodigiously controlled technique, with a totally uncompromising attitude towards music. The open-mindedness in terms of originality of phrasing, which goes all the way down to the last millimetre of sound, is something that is almost incomparable today . . . It's the total concentration that is so extraordinary. There is never a sense of brutal sound, although he has a power and he can produce a volume that is also unparalleled. I must say that when I hear him or when I work with him, I don't go into any kind of analysis. I¿m just mesmerised by his playing.
. . . is this enigmatic, marketing nightmare of a pianist worth your attention? Definitely. Sokolov's Mozart is as pristine as that of Maria Joao Pires, yet in the old-school manner his melodic line comes across as a string of glistening pearls. His phrases breathe naturally, and his fast passagework is evenly produced. A precious opportunity to sample the playing of one of the great pianists of our time . . . every prelude, every sonata movement, becomes a perfect, self-contained musical entity.
. . . a reminder of how powerful piano-playing at its most individual can be, crushing a number of the younger whippersnappers with new recordings of the Chopin Preludes. Dazzling piano playing from a rarely heard master . . . Here Sokolov offers two piano sonatas in F major by Mozart, played with tremendous virtuosity and conviction . . . His Chopin performances here are equally personal and captivating. As a bonus there are encore pieces from Scriabin, Rameau, and Bach which show off Sokolov's brilliance in all its varied moods.
. . . [was Sokolovs] so faszinierende Eigenart ausmacht, das ist sehr gut zu erleben auf seinem neuesten Album . . . Das Wunder geschieht schon nach wenigen Takten, hat der Hörer doch ganz schnell das Gefühl, dass da endlich einmal ein Pianist ganz nah an der Musik atmet, dass sie unter seinen Händen zu leben beginnt. Mit Schönheit im herkömmlichen Sinn hat das wenig zu tun. Sokolov zielt tiefer, er versucht in jedem Takt und Ton das Unbedingte, das Kühne und das Existenzielle dieser Stücke zu belegen. Endlich einmal erlebt der Hörer im Klang, was sonst nur behauptet wird: dass Chopins Mozart-Begeisterung keine Allerweltsformel ist, sondern sich einer profunden Auseinandersetzung verdankt. Schon der Vorderteil mit zwei F-Dur-Sonaten von Mozart (KV 280 und 332) enthebt die Rokoko-Raffinesse so sehr der Routine, dass jede Note individuell zu sprechen scheint; danach steigert Sokolov seine Deutung der kurzen Chopin-Préludes [noch um einiges] . . . Selbst die sechs Zugaben folgen dem typischen Sokolov-Muster: zweimal Chopin, zweimal Skrjabin, schließlich Rameau und Bach. Nachdem sich so der musikhistorische Kreis geschlossen hat, dürfen die Hörer mal wieder rätseln, wie jemand so viele kleine Wunder an einem Abend vollbringen kann. Die große russische Interpretationstradition ist im Spiel des Pianisten Grigory Sokolov zu spüren. Mit einer gewaltigen Ausdrucksbandbreite, die das Werk und nicht den Pianisten in den Fokus rückt . . . mit einer pianistischen Meisterschaft und gleichzeitig einer konzentrierten Gelassenheit -- so könnte man es vielleicht formulieren -- die in Pianistenkreisen heute rar und deshalb umso wohltuender ist. Schubfachdenken ist dem Meister an den schwarzweißen Tasten ohnedies fremd und so verwöhnte er sein Salzburger Publikum bei vorliegendem Rezital mit der ganzen Spanne seines stilistischen Könnens . . . [Chopin]: auch hier ist die Auswahl vielfarbig gelungen. Brillante Interpretationen . . . vom hochemotionalen, bewegten Chopin, über einen klaren, pointierten und doch überaus sanglichen Mozart bis hin zu den feinsinnigen, verspielten "Sauvages" eines Rameau. Was immer auffällt, ist der intensive, warme, nie strapazierte, wohl aber durchaus kräftige Ton des Sokolovschen Spiels. Auch das ist heute selten geworden, diese hohe Kultur des Anschlages, wie auch das Transportieren musikalischer Aussagen ohne Übersteigerungen, mit eben dieser überlegenen Schlichtheit, die diesem großen Pianisten eigen ist. Ein überaus empfehlenswertes Hörerlebnis. Rauf und runter propellern die Sechzehntel der linken Hand, fröhlich wie Schwärme von Flügelsamen des Bergahorns in der Oktoberböe. Das rechte Pedal des Flügels bleibt ungetreten. Es soll ja nichts verwischen. Und die rechte Hand? Gibt den gut gelaunten Guck-in-die Luft. Zwitschert himmelwärts und wiegt sich in Unschuld -- gerad' wie die Pilze niesenden Kobolde in Alexander Rous Märchenfilm "Der Hirsch mit dem goldenen Geweih": "Die Hauptsache ist was? Die Hauptsache ist, dass -- wir beide nichts, aber auch gar nichts damit zu tun haben". Grigorij Sokolow spielt das Prélude G-Dur op. 28 Nr. 3 von Frédéric Chopin, als hätten seine beiden Hände nichts, aber auch gar nichts miteinander zu tun. Diese Unabhängigkeit ist mit der Zeit immer abenteuerlicher und vergnügter geworden . . . [Mozart 2]: Alles so innig und logisch, dass man sich fragt, wie es je anders gespielt werden konnte. So schreibt Mozart im Kopfsatz der Sonate eine Folge von sechs Takten über einer Basslinie, die in Halbtönen ansteigt: e-f-fis-g-gis-a. Von Takt zu Takt ist es erst laut, dann leise. Dieser Wechsel zeichnet Spannung und Entspannung, Dissonanz und Konsonanz nach. Aber statt alles nur akademisch abzuhaken, verwandelt Sokolow diesen Wechsel in jenen von Sehnsucht und Scheu, Vorstoß und Rückzug, Nähe und Abstand. Musikalische Ordnung wird zum Verhalten einer lebendigen Figur. Und diese Lebendigkeit zeigt sich auch in der Freiheit der Verzierung. Denn kaum einmal spielt Sokolow zweimal das Gleiche, auch wenn es so in den Noten steht. Ganz wie zu Mozarts Zeiten üblich, bringt er eigenhändige Schnörkel oder Füllnoten an. So wird die Musik -- mit dem Ornament als Feier der Unwiederbringlichkeit -- bei jeder Wiederholung neu, besonders im zweiten Satz, einem todtraurigen Wiegenlied in f-Moll. Jedem Einsatz des Hauptmotivs schenkt Sokolow zudem den Charakter eines eigenen Instruments: erst Oboe, dann Klarinette, dann Fagott. Ihre Linien schieben sich räumlich untereinander. Aus der Flächigkeit tritt der Klavierklang ein in die Dreidimensionalität. Dieses Spiel mit Raum und Fläche beherrscht Sokolow auf erstaunliche Weise. Das Prélude in c-Moll aus Chopins Zyklus op. 28 explodiert am Anfang in einem Fortissimo, das dem Ohr nicht erlaubt, die Choralmelodie zu orten. Man hört sie, irgendwo in einer Wolke von schwirrendem Schutt, weiß aber nicht, ob oben oder unten. Und dann, mit dem Kippen ins Leise, sind die Raumkoordinaten plötzlich wieder klar: Wie ein greifbares Ding ragt die Oberstimme aus dem sinkenden Staub heraus . . . [CD 2]: Da schimmert der Klang bei Skrjabin wie Öl auf einer Wasserlache, da sirrt er silbern wie ein Clavecin bei Rameau, und samten summt er, in Dunkel versunken, bei Bach wie zu den hohen Zeiten russischer Klaviermystik. Doch nie zerreißt die Einheit des Empfindens in historisierende Klänge und Stile, die uns die Musik fernrücken würden. Sokolow bringt sie uns nah, mit allem Leben, das in ihr steckt, und das mit jeder Wiederholung neu entsteht. Es stimmt einfach alles: Das Timing, die vielen Farben, jeder Ton fügt sich perfekt ein in das Gesamtgefüge. Und dabei perlen Sokolovs Finger so mühelos über die Tasten, dass man beinahe vergisst, wie technisch anspruchsvoll diese Musik ist . . . [stets ist] die Struktur präsent. Meisterhaft vereint er Klarheit und Emotion. So durchdacht alles ist, Sokolov verliert nie seine Spontaneität. Er gibt sich ganz der Musik hin, lässt sie sich, bei allen Gedanken, die er sich vorher über Ausdruck und Struktur gemacht hat, im Moment entfalten. Das ist Sokolovs unverwechselbares Markenzeichen: die Ernsthaftigkeit, mit der er der Musik dient -- unprätentiös, voller Hingabe, ohne Eitelkeit. Und typisch Sokolov ist der leicht getupfte Anschlag, der trotzdem griffig ist. Das macht seine Interpretationen so unglaublich klar und intensiv: intim im Leisen und mitreißend im Schnellen . . . wunderbar leicht- perlende Mozart-Sonaten . . . Es ist bewundernswert, wie häufig Sokolov auf der Bühne an die Grenzen des Machbaren geht, krasse Lautstärkenwechsel macht oder extrem schnell spielt . . . [eine] mitreißende, tiefgründige und nuancenreiche Aufnahme . . .
. . . [Chopin / Prelude op. 28 no. 4]: [Sokolov spielt es] in betörendem Piano, fein abgestuft, mit stets kernigem und doch unglaublich nuanciertem Klang. Sokolovs Klangfarben und Schattierungen sind immer wieder als sein Markenzeichen herausgestellt worden. Man kann unterstreichen: zu Recht, wenn man . . . [diesen Konzertmitschnitt] hört. Wie Sokolov hier bei seiner Interpretation der 24 Chopin-Préludes Übergänge gestaltet, die Mini-Tableaus in ein Gesamtgefüge zusammenbringt und doch in ihren Kontrasten auch entschieden voneinander absetzt, ist bezwingend . . . [Mozart]: Mit fast demütiger Innigkeit gestaltet er die langsamen Mittelsätze, um dann wieder mit aufbrausender Helligkeit freudig mitzureißen . . . [mit den Zugaben] ist eine stilistische Breite dokumentiert, die repräsentativ ist für den Einzelgänger Sokolov . . . Charakteristisch für dieses wunderbare Tondokument ist schließlich die prickelnde Konzertatmosphäre. Sie vermittelt sich in der gespannten Aufmerksamkeit des Publikums genauso wie in dem konzentrierten, hingebungsvollen und durchweg natürlichen Spiel von Sokolov. Dass er technisch die größten Herausforderungen mit scheinbarer Leichtigkeit bewältigt und jede Triller-Mühen vergessen lässt, unterstreicht seine souveräne Musikerpersönlichkeit. Zweifellos: Dieses Doppel-Album ist ein Ereignis! Alles ist Magie in diesem Klavierspiel . . . [ein] Wunder . . . Man kann die Spannung und Atmosphäre dieses Festspielabends gleichsam mit Ohren greifen . . . [Chopin / 24 Preludes op. 28]: Sokolov spielt diese Werkfolge kompromisslos. Kein Hauch von Salonduft liegt über den Piecen, jedes der Stücke, oft nur minutenkurz, hat seine eigene Physiognomie, gewonnen aus Tonart, Form und melodisch-harmonischer Expression, Spielfluss und pianistischer Farbgebung. Einen "Pianisten der tausend Farben" hat man Sokolov gelegentlich genannt. In diesem Préludes-Kosmos kann man das auf wundersame Weise hören . . . [Mozart]: was erzählt uns dieser Spieler nicht mit diesen Werken! Es ist die imaginäre Bühne, die Mozart in allen seinen Werken immer neu betritt und auf der der Interpret die Gestalten lebendig machen muss. Nehmen wir nur das Beispiel des Adagio aus KV 332: fünf Minuten aus feinster, aber fast simpler Melodie über konventionellen Begleitfiguren, die zuweilen mit fast unmerklicher Modulation von Dur in Moll gleiten. Bei Sokolov ist das ein Akt subtilster Verschattung, so als ob sich für eine Phrase eine Wolke vor die Sonne schieben würde -- magisch und zum Weinen schön, Zuversicht und Zweifel, Trauer und Trost in einem Atemzug. Das alles kann man jetzt hören, so oft man mag. Man möchte, dass es gar nicht aufhört. Und man sollte dafür nicht nur dem einzigartigen Pianisten danken, sondern auch Produzenten und Technik . . . Hier ist er: ein Edelstein!
. . . Grigory Sokolov begeistert . . . Was Sokolovs Spiel so einzigartig macht, sind seine Poesie und Ausdruckstiefe. Spieltechnisch scheinen ihm dabei kaum Grenzen gesetzt zu sein, und an klanglicher Differenziertheit kommt ihm ohnehin kaum jemand gleich . . . [die Chopin-Préludes] sind eine Sensation . . . [eine Einspielung voller] Leidenschaft und Brillanz . . . Die emotionale Intensität und gleichzeitig Eleganz des Fis-Moll-Préludes allein würden den Kauf dieses Albums lohnen. Dazu entfaltet Sokolov einen ganz eigenen poetischen Zauber, so in dem nur wenige Takte umfassenden A-Dur-Prélude, einer kleinen Mazurka. Zu nennen wären auch das pianistische Feuerwerk des B-Moll-Préludes und die sprühende Klanglichkeit des Es-Dur-Préludes . . . Ganz entspannt lässt er einen verspielten Suitensatz von Jean-Philippe Rameau vorüberziehen, ehe er mit einer mit ruhigem Ernst und leichtem Nachdruck gespielten Bearbeitung des Bach'schen Orgelchorals "Ich ruf zu dir, Herr Jesu Christ" den Schlusspunkt setzt . . . Mit seinem Doppelalbum wird Sokolov nicht nur eine Menge neuer Bewunderer gewinnen. Es ist auch ein starkes Plädoyer für die Live-CD.
. . . [jetzt wird sich] das Sokolovfieber weltweit ausbreiten . . . der letzte Erbe der russischen Klavierschule, ein höflicher Einsiedler, ein stiller Prophet, ja ein Guru, der seine Botschaft mit zehn Fingern verbreitet . . . [die Darbietungen Sokolovs haben] immer etwas von einem Hochamt. Es geht eine Aura des Sakralen aus von seinen eigenwilligen [Interpretationen] . . . ein Zauber, dem sich im Konzertsaal niemand entziehen kann und den die Tonkonserve teilweise bewahrt . . . [Chopin / Prélude no. 16]: Wie ein Nebelspuk fliegt das vorbei, in einer Minute, trotz der affenartigen Geschwindigkeit aber mit aufgehobenen Dämpfern und Legato . . . eine dynamische Kurve baut sich auf, die Linien der rechten Hand treten strukturierend hervor. Man staunt, wie so etwas überhaupt möglich ist . . . [Chopin / Prélude no. 4]: [Sokolov gestaltet] das konstante Ostinato wie den Prozess einer langsamen Versteinerung und die Melodielinie, als müsse er sich von jedem Ton einzeln verabschieden. Man denkt sich, danach könne es nicht mehr weitergehen. Und zugleich: Das dürfe niemals aufhören. Die sechs Zugaben, die das Abenteuer dieses Recitals ergänzen, stellen zwei farbenleuchtende Skrjabin-Poèmes neben die trillerklingenden "Sauvages" von Jean-Philippe Rameau und zwei Chopin-Mazurken neben Johann Sebastian Bachs Choralvorspiel "Ich ruf zu dir, Herr Jesu Christ". You think to yourself: it couldn't keep on going after that. And at the same time: it mustn't ever stop.
. . . ein beeindruckendes Zeugnis seiner kompromisslosen Kunst . . . Hingebungsvoll widmet sich der Künstler den beiden F-Dur-Sonaten K 280 und K 332 von Wolfgang Amadeus Mozart, er tupft, haucht und streichelt die Töne in die Tasten, lockt die Musik mit wenig Pedal und stiller Größe aus den sicheren Gefilden heraus und trägt sie dorthin, wo es existenziell wird, wo jeder Atem, jede melodische Wendung und jeder harmonische Wechsel die Welt bedeuten. Mozart, so verstanden, klingt nie nur schön, leicht und farbenreich. Mozart, so verstanden, hat eine herzzerreißende Tiefe, die Sokolov in seinem Spiel mit akribischer Manie wahrhaftig ans Tageslicht befördert. Nur selten blitzt Humor auf in seinem Spiel, viel zu ernst ist es Sokolov mit der Musik, jener Seite des Lebens, die von ihm nie als Beruf verstanden wurde, sondern immer als ein Aspekt des menschlichen Seins. In den 24 Préludes op. 28 von Frédéric Chopin erscheint dieses Sein in mannigfaltiger Farbigkeit, hybrid ausgeleuchtet, schmerzhaft und unnachgiebig an die Grenzen getrieben, eine manische Gratwanderung zwischen überirdischer Schönheit und düster drohendem Abgrund. Sokolovs makellose, brillant virtuose Technik steht bei diesem Balanceakt immer im Dienste der Musik. Sie schafft die Basis für die Freilegung höchster Musikalität, sie lässt den Klang voll und satt werden, ohne je massiv zu wirken und sie leuchtet in das pianistische Stimmgeflecht hinein gleich einem Scheinwerfer ins Dickicht. Sokolov wird dabei zum Mystiker an den Tasten: ein beseelt und besessen Suchender, der keinen einzigen Ton dem Zufall preisgibt und doch immerwährend ringt um die Freiheit der musikalischen Aussagen. Der Konzertabend auf CD schließt, wie immer bei Sokolov, mit vielen und eigenwilligen Zugaben. Selten gehörte und außergewöhnliche Klanggebilde von Scrjabin, Rameau und Bach, Herausforderungen für das Publikum, das schlussendlich begeistert tobt, stampft und klatscht. Zu den Höhepunkten gehört das dämonische Prelude Nr. 8 in fls-Moll, eine Skizze des Wahnsinns und von Sokolov ungeheuer dramatisch dargeboten, das mit feinster Pianissimo-Kultur interpretierte Nr. 4 in e-Moll sowie das betörend graziös gespielte Nr. 11 in H-Dur. Doch auch in den anderen Stücken des Zyklus zeigt Sokolov nicht nur, dass er zu den Pianisten mit dem größten farblichen und dynamischen Spektrum gehört, sondern auch, dass Chopins Werken eine Tiefendimension innewohnt, die der von Schubert und Schumann vergleichbar ist. Man muss sie nur herausarbeiten . . . Die sechs (!) Zugaben wiederum sind interpretatorisch so originell, zwingend und pianistisch ausgefeilt, dass man aus dem Staunen nicht mehr herauskommt . . . Alleine deswegen lohnt sich die Anschaffung des Albums.
. . . [es] teilt sich einmal mehr Magie mit. Wenn Sokolov die Préludes op. 28 von Frédéric Chopin spielt, hat man das traumhafte Gefühl, bei dem introvertierten Klangtüftler des 19. Jahrhunderts in dessen Pariser Exilwohnung zu stehen. Und auch die Mozart-Sonaten und Zugaben (von Scriabin, Chopin, Rameau und Bach) gelingen im wahrsten Sinne unvergleichlich.
. . . pure Wiederhörensfreude mit dem Russen Grigory Sokolov . . . [ein] legendärer Salzburger Klavierabend . . . Wir erleben Sokolov als überwältigenden Erzähler. Nichts dekliniert er, nichts übertourt er -- Mozart ist ein Freund, den Sokolov seit Jahrzehnten kennt und mit dessen Eigenheiten er fast gelassen umgeht. Und wie Sokolov bei Wiederholungen Ornamente einstickt, das zeigt ihn als Großpianisten, der sich vor Mozart nicht fürchtet, sondern ihm so verbunden ist, wie es enger kaum geht. Wunderbar! Er ist der Carlos Kleiber der Pianisten: Ein phänomenaler Musiker, der sich dem Medienrummel verweigert und "nur" muszieren will . . . [seine Aufnahmen genießen] unter Kennern Kultstatus . . .
Es ist schwer zu beschreiben, was Sokolovs Spiel so besonders macht. Sicherlich ist es zum einen die Durchdringung der Werke in kaum dagewesener Intensität bei faszinierender Klangaustarierung in jeder Nuance. Zum anderen ist es aber auch der Überblick über die Struktur der einzelnen Stücke, der Sätze . . . beispielsweise hört man nur selten einen so fein strukturierten und dennoch lebendigen Mozart, der das Opernhafte ebenso wie das Pianistische so wunderbar in seiner Musik vereint . . . Und wenn dann Chopin erklingt, scheint es fast so, als habe er das Instrument getauscht, denn die Klangausbeute ist vollkommen anders. Welcher Pianist erreicht dieses Phänomen schon so wie Sokolov innerhalb eines Konzerts? Und dieser Pianist durchlebt die Preludes, wobei er die Besonderheiten der Harmonik so deutlich herausarbeitet, dass einige wie neu erklingen. Dieselbe Intensität hält er auch bei jeder der Zugaben und zeigt in diesen immer wieder, dass er in jedem Stil, in jedem Werk, gleichgültig aus welcher Epoche es stammt, dieselben hohen Kriterien zugrunde legt und ihnen gerecht wird. Denen, die seine Konzerte besuchen, gilt der scheue Sokolov längst als größter Pianist unserer Zeit. Nun hat er den Mitschnitt eines triumphalen Abends von 2008 als CD zugelassen. Ein Doppelalbum von Rameau bis Scriabin, das sprachlos macht. Wenn Grigory Sokolov sich an den Flügel setzt, entsteht eine magische Aura . . . Sokolov entlockt dem Klavier subtile Klänge, die man diesem gar nicht zutraut -- aber nie, um damit Effekt zu machen, sondern um der Musik Ihre Größe und Würde zu verleihen. Ob Sonaten Mozarts oder die Préludes von Chopin -- alles wird hier zum Ereignis. ["The Salzburg Recital"]: Warum Sokolov ausgerechnet dieser Abend als bleibender Wert angemessen erschien? Keine Ahnung. Obwohl: doch. Ein derart weit ausholendes Panorama aus Gefühlen und Strukturen, das von Rameaus fein verspieltem, quecksilbrig luftigem Barockgetriller in "Les Sauvages" bis zur entrückten Klangfarbenmalerei Skrjabins reicht, den Weg über Mozart-Sonaten zu Chopins 24 Etüden nicht scheut, die er zu Bekenntnisstücken vertieft? Das ist ein furchterregend komplettes Programm, bei dem weniger begnadete Pianisten nur betreten das rettende Weite suchen können. Sokolov spielt so etwas, hintereinander weg. Einfach so, als ob es nichts wäre, weil es alles für ihn ist . . . Bei Sokolov bleibt das große, ewige Rätsel, das mit nur sehr wenigen Virtuosen verbunden ist: Wie? Wie weiß er so genau, wann ein Spannungsbogen eben gerade noch nicht reißt? Wie bekommt er eine Flügel-Mechanik dazu, einen Ton zu produzieren, der lebt? Zu vermuten ist, dass er es selbst auch nicht weiß, weil es einfach geschieht. Es wäre ihm zu wünschen.
. . . ein beeindruckendes Zeugnis seiner kompromisslosen Kunst . . . Hingebungsvoll widmet sich der Künstler Mozarts beiden F-Dur-Sonaten KV 280 und KV 332, er tupft, haucht und streichelt die Töne in die Tasten, lockt die Musik mit wenig Pedal und stiller Größe aus den sicheren Gefilden heraus und trägt sie dorthin, wo es existenziell wird . . . Der Konzertabend auf CD schließt, wie immer bei Sokolov, mit vielen und eigenwilligen Zugaben. Selten gehörte und außergewöhnliche Klanggebilde von Scriabin, Rameau und Bach, Herausforderungen für das Publikum, das schlussendlich begeistert tobt, stampft und klatscht.
. . . [un] superbe concert . . .
. . . [un] document indispensable à l'amateur des "grands" du piano comme à celui imbu de perfection musicale à tous les niveaux . . . Moments de sublimation avec la lecture des deux sonates peu connues en fa majeur de Mozart. Cela donne le frisson. Avec un toucher totalement dépouillé d'artifices, Sokolov porte la simplicité de l'écriture mozartienne aux sommets de la beauté. On restera suspendu à son l'adagio de la sonate KV 280 où le piano du maître russe exprime avec grâce et profondeur les couleurs sombres et émouvantes de la sicilienne comme on se régalera de l'explosivité joyeuse du presto de la sonate KV 232. Avec les 24 Préludes op. 28 de Chopin, Sokolov offre une palette infinie de couleurs et de nuances, toujours enrichies d'incises même à l'intérieur des plus courtes pièces de ces préludes. Le toucher précis et mordant du pianiste fait ici merveille conférant à cette oeuvre une articulation musicale parfaite et riche d'un charme inoui. Une musique totalement habitée. La générosité de Grigory Sokolov n'est ici pas mise au trou puisque après cet imposant programme, il offre une quinzaine de minutes de bis où se côtoient de une brochette d'oeuvres peu connues de compositeurs comme Scriabine, Rameau. Pour clore cet exceptionnel récital, le pianiste rejoint alors les hauteurs spirituelles avec un choral de Bach tiré du "Orgelbüchlein". Sublime recueillement qui laisse l'auditeur sans voix. 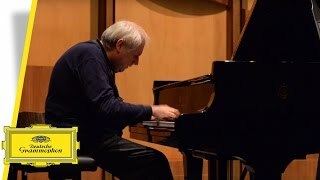 Dans ce récital, Grigory Sokolov démontre, si besoin l'était, qu'il a atteint une dimension pianistique et musicale qui va au-delà de la technique, voir de l'interprétation. Habité d'un bout à l'autre de son récital, c'est l'image de la sérénité bienfaisante, de la plénitude qu'il offre à son auditoire. C'est un véritable cadeau de la nature qu'un tel récital ait vu le jour et c'en est un autre que de pouvoir le recevoir sous la forme de ce disque. Parmi les bis / encores de ce récital généreux, saluons Scriabine et ses deux poèmes (deux allegrettos, étincelants, fantasques) opus 69 no. 1 et no. 2, vraies miniatures traversées par l'esprit malicieux et enchanté du Scriabine prophétique auquel le jeu du pianiste russe apporte l'ivresse funambule adéquate . . . Largeur de la vision, souffle épique de son engagement, Sokolov nous fait vivre l'espace d'un concert, la formidable épopée du piano orchestre, capable de suggestion murmurée comme fracassante . . . L'artiste préféère panacher plutôt que de se dédier à telle ou telle intégrale: la mixité colore pour chaque session, une expérience particulière.